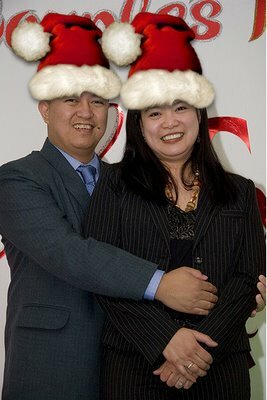 I would just like to take this opportunity to greet everyone a Merry Christmas and a Happy New Year! Holiday Greetings goes most especially to my family - Nanay and Tatay in the Philippines, Elmer, Pamie, Jodi and Joshua in New Jersey and to all relatives in the States. My in-laws, my uncles and aunts, my cousins and their own families, my "pamangkins" and "inaanaks", "ninongs" and "ninangs". My friends, Gobbils, Flickers Photo Club, flickr friends and contacts, former classmates - FEU Batch 85, OLCAGS 81, friends in Brunei, in Malaysia, in Singapore, in India, and in Qatar. Former bosses, current bosses, former and current colleagues. Derek, Jenny, Jackie and Gina in Brisbane, Australia. Paolo, Coco and Gabby in Perth. Fr. Corsie. And to everyone else; there are so many of you who have in one way or another have touched our lives and continue to be a part of it. One more time - MERRY CHRISTMAS AND A HAPPY NEW YEAR!! - and God Bless you all!! I am perhaps one lucky fellow. I am one of the many professionals from around the world who played a part in the design and construction of the main venue - the Khalifa Stadium. Yet I am the only one (that I know of) who got lucky enough to witness this huge project be put to use for what it was design and constructed for - The 15th Asian Games in Doha, Qatar. I guess it has a lot to do with photography. Our company needs high quality images of the stadium and the opening ceremony for its marketing purposes. In the office I am the employee who is most vocal about my passion with photography. And so when my office needed such images, I was chosen for the mission. I have posted some of the photos I took in my flickr account. I wish I could write a dedicated blog here but the story is more of pictures than of words. Come back often to these links because they will go on for the duration of the Asian Games which ends on the 15th of December 2006. I've got plenty of pictures to post both from the opening ceremony and a few sports action that I'm planning to watch. 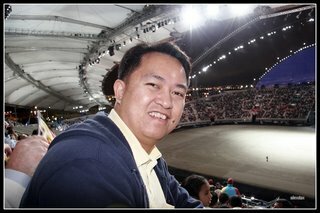 In the opening ceremony alone, I managed to click 591 photos (can't share all of it though.) Imagine how much more I can shoot.